Everyone seems to be talking about Packers QB Aaron Rodgers versus the Philadelphia Eagles defense as the key matchup. If they are not talking about that aspect being the main key to the game, then they are surely talking about Eagles’ first-year quarterback Kevin Kolb and his struggles in the preseason against a 3-4 defenses. The same type of 3-4 defense, which he will face this weekend. However, the single most overlooked facet of the week one tilt between the Philadelphia Eagles and the Green Bay Packers might be the return abilities of do-it-all receiver DeSean Jackson and starting Eagles cornerback Ellis Hobbs. Over the past two seasons, Jackson has been the most dynamic punt returners that the game has seen over the past decade. Every time opponents punt the ball to him, they must fear and dread the fact that he can take it to the house for a huge momentum swing. In the last two season openers, Jackson has been deadly as a punt returner. Against the St. Louis Ram in 2008 to kick off his NFL career, he had eight returns for 97 yards. Moreover, he nearly took a punt to the house as he juked his way down the field for 60 yards, which ultimately set up an Eagles field goal. The following season against the Carolina, he one-upped himself. With just two punt returns, Jackson amassed 102 yards and had an 85-yard punt return for a touchdown. His touchdown sparked the Eagles and began the 38-10 route against the Panthers. So what makes anyone believe that he can continue to do this against a Super Bowl contender in the Green Bay Packers? Well, special team’s coverage was one of the areas that the Packers struggled in 2009. Packers’ punter Jeremy Kapinos averaged 43.8 yards per punt, which is a not too shabby. However, his special teams’ coverage was lousy. This enable teams to have excellent field position and put their defense in a bind with a short field. At the end of the 2009 season, the Packers punted the ball 60 times. In 40 return attempts, they allowed opponents 403 total punt return yards, which ranked as 27th in the league. Additionally, Packers special teams coverage allowed 10.1 yards per return, which was tied for 24th in the NFL. If those stats do not explain their deficiency then Kapinos’ net return per punt of 34.7 yards will do that. His net punt returned finished tied for the worst in the league with New England’s punter Chris Hanson. Look and compare the same categories between the Eagles and Packers. 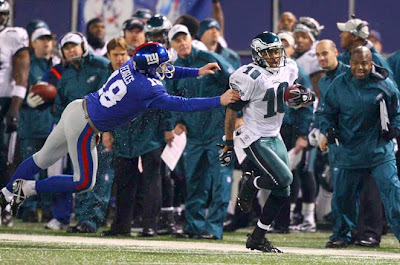 The Eagles coverage finished third in the league by giving up a mere 5.9 yards per return on 39 attempts (229 yards). Punter Sav Rocca finished in the middle of the pack with a 38.3 net return average per punt. That extra five yards could be huge difference in the outcome of the game if it comes down to a battle of field position. If the Eagles expect to have a realistic chance at beating the Packers then they will need their superstar punter to step his game up. This is an obvious weakness and flaw in the Packers that Jackson must be able to exploit it. Still, Jackson is not the only player that must be a force on special teams. Expected kickoff return man and starting cornerback Ellis Hobbs has to have a huge game. The Packers punt coverage is a glaring weakness, but their kickoff return coverage is also very generous. Last season, the Packers scored at an alarming pace just like the Eagles, so they got a ton of practice on kickoff coverage. In fact, the Packers had 81 kickoffs and the Eagles had 80. Nevertheless, the Packers finished 29th in the league by giving 1,824 total kickoff return yards. Furthermore, the Packers kickoff coverage constantly permitted opponents to start with good or decent field position due to their 22.8 yards per return average; ranked 18th in the NFL. Meanwhile the Eagles have their own set of problems as finished 30th in the league by allowing 1,907 total kickoff return yards. Head coach Andy Reid is hopeful that new Special Teams Coordinator Bobby April can fix this area of concern. One of the main reasons that the Eagles were intrigued and eventually acquired Hobbs was due to his amazing return skills. 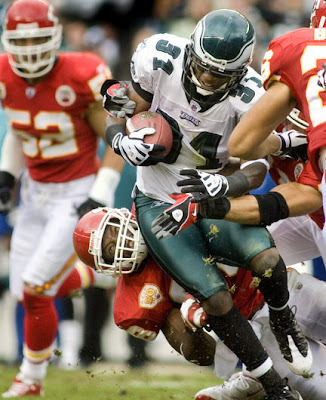 In the 2008 season, the Eagles finished 19th in the league with a 23.5 yards per return. Moreover, Quintin Demps managed to wiggle his way up the field for an average of 25.3 yards per kick return, but they still thought they could get better and he was trusted into the starting free safety role. 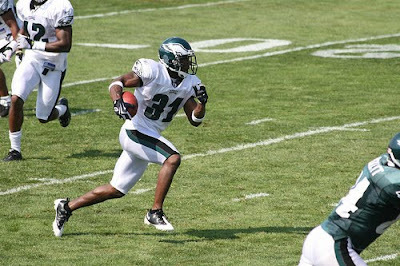 When the Eagles sent a fifth-round pick to the New England Patriots for Hobbs during the 2009 NFL Draft, they believed they were receiving the second-ranked kickoff returner from 2008 and the seventh in 2007. In ’08, Hobbs returned a kick 95 yards for a touchdown and was second in the league with a 28.5 yard per kickoff return. The previous season (2007), Hobbs averaged 26 yards per kickoff and had a 108-yard touchdown return. 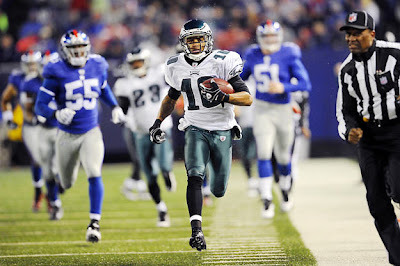 In just nine games in ’09, Hobbs had 20 opportunities as the Eagles’ main kickoff returner. He did not take advantage of those opportunities as he failed to take a kickoff down the sidelines for a touchdown (first time in his three years as a returner). In addition, he ranked 19th in the NFL with a 24.1 yards per return. While the league’s best (Tampa Bay’s Clifton Smith at 29.1 yards) was only five yards better than him, those five yards can be the difference of being in field goal range or even setting up a touchdown. Of course, Hobbs had a down year if you comparing his previous two seasons with the Patriots to his half season with the Eagles. Despite his decline in numbers, there are no reasons to suggest that Hobbs cannot once again be a elite kickoff returner and deliver close to or even better than his career average of 27.3 yards per kickoff return before arriving in Philadelphia. As the analysts and experts breakdown the anticipated Eagles versus Packers matchup over the next couple days, special teams might be mentioned for a brief second or in passing. Nonetheless, it could be Hobbs and Jackson’s knack of changing the game without either the offense or defense being on the field that might have the Eagles soaring after week one.